Do not confuse this with the modern country Ghana. 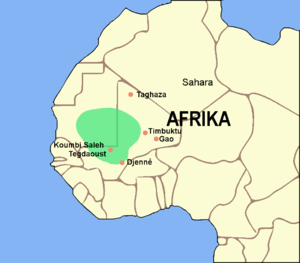 The Ghana Empire was in what is now southeastern Mauritania, Western Mali, and Eastern Senegal. It is also sometimes called the Wagadu Empire. It started in about 750 and ended in about 1076. They had two sides; Muslim and Non-muslim what divided them was a 6 mile boulevard (street). Ghana sat on top of a gold mine and was a very wealthy empire. Its capital was Koumbi Saleh. Surrounded Modern Northern Senegal and Southern Mauritania. Traded with Saharans in gold and salt. This page was last changed on 9 June 2018, at 06:35.